If you live in an older home and you find that the ceiling height in your basement is too low, you could lower the floor in one of two ways. One method is called the curb system where you don't actually underpin the foundation walls but you add a concrete curb at the base of the foundation walls after you have excavated the depth that your require. Excavation is usually in 4 ft sections. Concrete curbs are usually done if you are not planning to lower your basement by more that 30 cm or 12 inches. The reason for this is that for every 7 inches you go down you will have to project out 10 inches from the foundation wall. Example, if you go down 14 inches you will have a curb projection of 20 inches into your basement. The only way you could achieve a ratio of 1:1, that is 7 inches down and 7 inches out, would be to hire a Geological Engineer to determine if your soil would be solid enough to withstand the weight of the house. You would then submit their report to the city when you apply for a building permit. 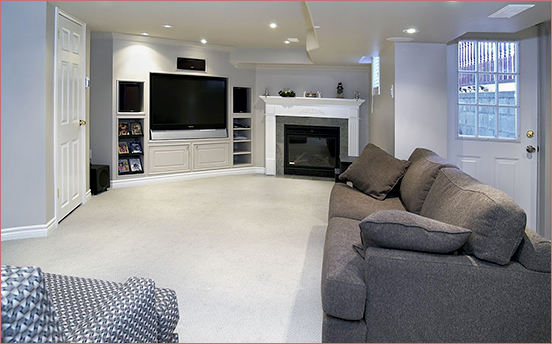 There are a few items you will have to consider when you are planning on lowering your basement floor. Should you change your furnace and furnace location? If you don't change your furnace you should have your furnace lowered to the new height of basement floor. Same with the Hot water heater. Should you upgrade to a tankless or change existing one. If you live in an older home you should consider having your sewer drains replaced with 4 in. PVC drain pipe. If you are in the Toronto area you would be required to install a sump pump in the basement. Have weeping tiles installed around the perimeter of the basement walls which would discharge into the sump. If your sewer drain leading out from the basement is too high for the depth you want to excavate to, you could have the city do a new connection from the outside of the house or you could install a sewage injector. You would be required to install a backwater valve where the sewer drain exit the basement. You would have to install a new set of Stairs and hand rail. You might want to consider installing Radiant Heating in the new basement floor. After you have had a structural engineer draw up a set of plans for underpinning your basement, and you submit your plans for approval from the city, you are now ready to proceed with the actual underpinning process. Your basement walls will be marked off in 4 ft sections numbered 1, 2 and 3 to determine the different stages of the process and at the end of number 3 the stages will reoccur. The excavation will begin but it must be done on a 45 degree angle of repose, or for every 7 inches you excavate 10 inches of dirt must be left against the foundation walls. The reason for excavating at the angle of repose is the pressure from the house does not actually go straight down, but is applies on a 45 degree angle that is why the dirt at the base of the foundation wall has to be wider as you excavate lower. At the bottom of your excavation point the dirt will now be wider than at the original height of the concrete floor. Never and I stress Never allow anyone to ever excavate straight down, or your house will collapse or you will have major structural problems. If you follow these rules you should not have a problem. After the initial excavation of the interior of the basement leaving the angle of repose, the process of actually underpinning the foundation walls will begin. Always remember never excavate into the angle of repose until you are ready to underpin that section. There are two methods of underpinning: Under pouring and over pouring. With the under pouring method the concrete is poured flush with front face of the existing foundations wall but is vibrated and under poured by at least 2 inches. After the concrete has cured at least 24 hrs , a non-shrink grout is dry packed into the cavity flush with the underside of the existing foundation footing. The over pouring method is done with the new concrete projecting at least 3-1/2 inches out from the existing foundation wall and is over poured and vibrated to at least 4 inches above the existing foundation footings. There is no non-shrink dry pack involved. Whichever method you use the excavation of the cavity is the same. All Number 1's are done at the same time. The dirt have to be excavated to the outside edge of the foundation footings and straight down to the new dirt level and only in 4 ft wide sections or smaller. You will want to go an extra 4 ins lower to accommodate for the 4 in weeping tiles. The cavity should be square and plumb and the underside of the footings should be cleaned of all debris. Make sure you do not excavate lower than needed because the new footings should be resting on undisturbed soil. When all the number 1's are excavated and inspected the forming for the new concrete will be done and the pouring of the concrete will commence. Make sure that the concrete is well vibrated as the concrete is being poured, weather you use the over pouring or under pouring method. The strength of the concrete should be 20 MPa. The non-shrink grout at 35 MPa. After all the number 1's are poured, wait 24 hrs to remove the forming for over pouring method or 3 days or 70% cured for under pouring method, and proceed with the excavation of all the number 2's, and repeat the same process as the number 1's. Proceed in like manner with the number 3's. All is complete , clean up and finish leveling the dirt floor. Install the Delta Wrap membrane from the new dirt level to about one foot above the underpinning joint. This is the process used to underpin the foundation walls of your basement. Make sure that you have all aspects of the Basement Underpinning process inspected by the city inspector. Have a structural engineer do your plans for the Basement Underpinning. If You Need Any Help Or More Information On The Basement Underpinning Process Do Not Hesitate.